Five years ago, when the Rev. 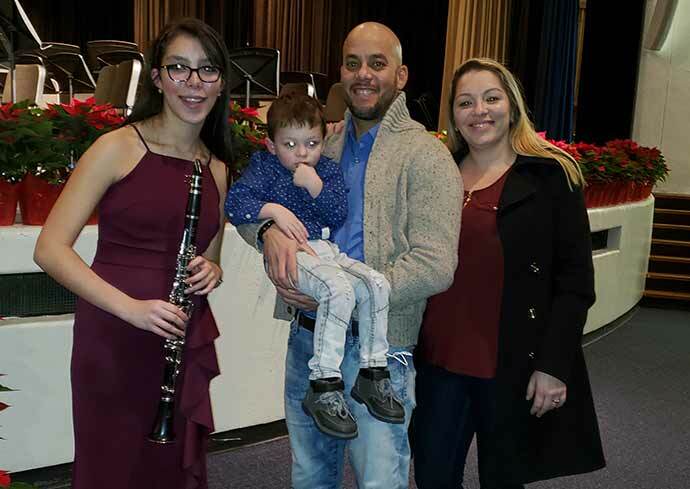 Yuri Carralero left Cuba with his family for life and ministry in the United States, he was experiencing the early symptoms of kidney disease, but a trip to the doctor revealed his kidney function was holding steady at 97 percent. Toward the end of 2017, only a few months after he and his family were appointed to Greggton UMC Longview, Carralero’s symptoms worsened dramatically. New testing revealed his kidney function had plummeted to only six to ten percent. Doctor’s rushed him into surgery to place an abdominal catheter for dialysis. 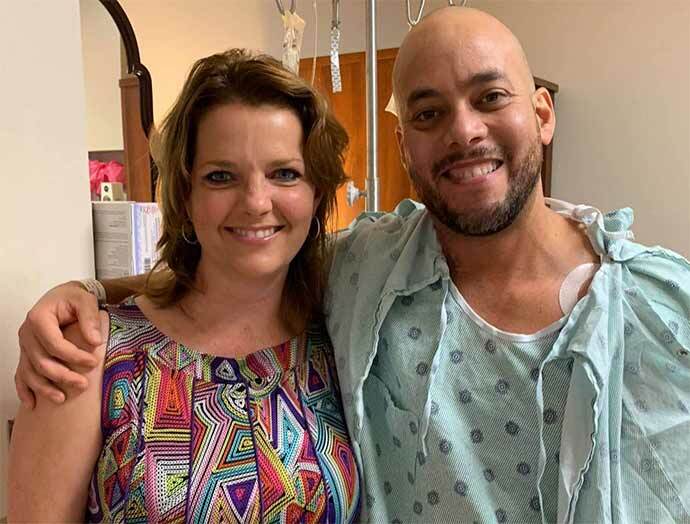 Normally, a patient will heal for four to six weeks following the surgery before beginning dialysis, but due to the severity of Carralero’s disease, he began dialysis the very next day after surgery. For the next year, Carralero underwent 12 to 14 hours of home dialysis every night. Meanwhile, Carralero, a father of two weakened. His skin deteriorated. His vision began to fail. During the long months of dialysis, Carralero continued to lead the Spanish speaking service at Greggton. In the autumn of 2017, a new worshipper, Kathy Wilson, began attending. She felt drawn by the Holy Spirit, even though she spoke little Spanish. Wilson and the Carralero family grew close, and God began whispering a plan for Carralero’s healing to Wilson’s heart. 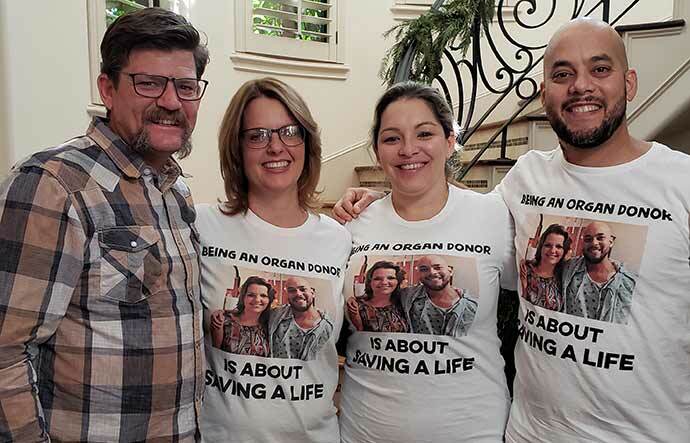 Carralero needed a kidney, and Wilson was going to find one. In early 2018, she took the first, simple steps on that journey. She began a Facebook page telling Carralero’s story. Soon, word spread throughout the country and across the globe about the young pastor who needed a kidney. In California, the post was shared from laptop to computer until it appeared in the Facebook feed of Andrea Armida Yochim, a friend of a friend of Wilson’s, an utter stranger to Carralero. Who was willing to make an incomprehensible sacrifice for a pastor in Texas, the gift of a kidney. After months of testing, the results were in- Yochim was a perfect match. She became vegan to prepare for the transplant. Her husband, Jared, joined her in support. Finally, the day for the transplant arrived. Carralero had yet to meet his donor when the doctors rolled him through the doors into surgery. Yochim, who underwent surgery first, lay recovering when Carralero’s wife and 13-year-old daughter stopped by to visit her. The young girl looked into the eyes of a stranger who had given her father relief from suffering and a new life. “Thank you for saving my father’s life,” she said. Yochim’s kidney began working right away for Carralero. The day after transplant, when nurses came to get him to take his first steps, Yochim’s husband, Jared, spotted him walking in the hallway. “Would you like to come meet Andrea?” he asked. Yochim considers herself a Christian, but for years has only attended Roman Catholic mass a couple of times each year, usually on holidays. Her new friendship with Carralero has caused her to ponder her faith. 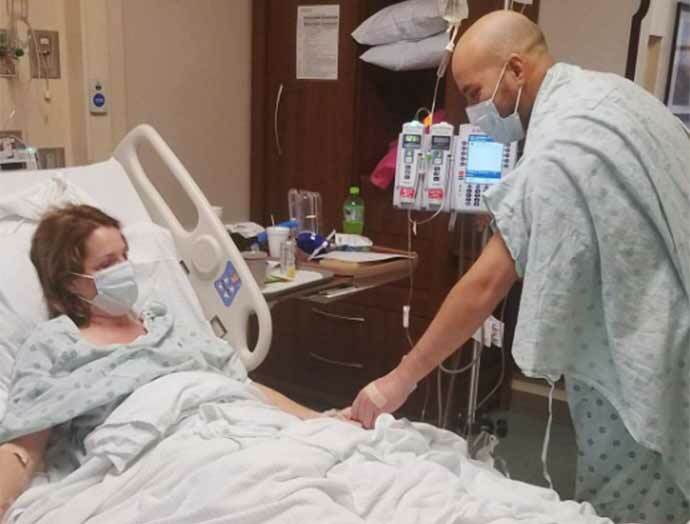 On her first trip to Houston Methodist hospital for pre-transplant testing, she went straight to the hospital chapel to pray for the first time in a long time. She told God she knew the transplant was more than she could handle on her own, and that she needed his help. Since her surgery, she has begun listening to United Methodist pastors’ sermons and is taking the first tentative steps to better know the God who gave her the help she so desperately needed that day in the chapel. Reece extended the invitation to the Carraleo family and they accepted. The family spent Christmas and New Years at the Jones’ home, filling their days together with prayer, laughter, and a lot of good Cuban food. Reece considers the time the Carraleo family spent in the Jones’ home a confirmation of her spiritual gift of hospitality. “Truthfully when I was preparing for them, I realized I could not wipe the smile off my face. I realized this gift of hospitality that I have been given really is a is gift from God,” said Reece.